The first 2016 issue of Hakusensha's Young Animal magazine is announcing on Friday that a new anime adaptation project of Kentarou Miura's Berserk manga has been green-lit. 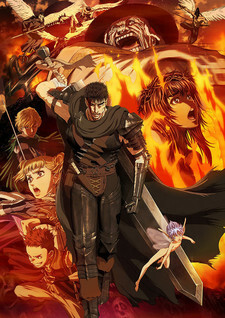 Miura comments in the magazine that the anime project will depict Guts in his "Black Swordsman" appearance, which is only revealed in parts of the manga that go beyond any previously animated Berserk story, and is only briefly hinted at in the first and last episode of the 1997 television anime series. A slideshow in every sense of the word. Horrific CGI fails to capture Miura's aesthetic. Just go read the manga.